(Gen 22:16-18) By myself have I sworn, said Jehovah, for because you have done this thing, and have not withheld your son, your only son: That in blessing I will bless you, and in multiplying I will multiply your seed as the stars of the heaven, and as the sand which is on the sea shore; and your seed shall possess the gate of his enemies; And in your seed shall all the nations of the earth be blessed; because you have obeyed my voice. This is an unabridged account of God’s blessing to Abraham. Though brief, its content is rich: It includes the reason for, and background to, God’s gift to Abraham, and what it was that He gave to Abraham. It is also imbued with the joy and excitement with which God uttered these words, as well as the urgency of His longing to gain those who are able to listen to His words. In this, we see God’s cherishment of, and tenderness toward, those who obey His words and follow His commands. So, too, do we see the price He pays to gain people, and the care and thought He puts into gaining them. Moreover, the passage, which contains the words “By myself have I sworn,” gives us a powerful sense of the bitterness and pain borne by God, and God alone, behind the scenes of this work of His management plan. It is a thought-provoking passage, and one that held especial significance for, and had a far-reaching impact upon those who came after. Was the blessing given to Abraham by God that we read of here great? Just how great? There is one key sentence here: “And in your seed shall all the nations of the earth be blessed,” which shows that Abraham received blessings not given to any who came before or after. When, as asked by God, Abraham returned his only son—his beloved only son—to God (note: Here we cannot use the word “offered”; we should say he returned his son to God), not only did God not allow Abraham to offer Isaac, but He also blessed him. With what promise did He bless Abraham? The promise to multiply his offspring. And by how many were they to be multiplied? The Scriptures provide the following record: “as the stars of the heaven, and as the sand which is on the sea shore; and your seed shall possess the gate of his enemies; And in your seed shall all the nations of the earth be blessed.” What was the context in which God uttered these words? Which is to say, how did Abraham receive God’s blessings? He received them just as God says in the Scriptures: “because you have obeyed my voice.” That is, because Abraham had followed God’s command, because he had done everything that God had said, asked and commanded without the slightest complaint, thus God made such a promise to him. There is one crucial sentence in this promise that touches upon God’s thoughts at the time. Have you seen it? You may not have paid much attention to God’s words that “By myself have I sworn.” What they mean is that, when God uttered these words, He was swearing by Himself. What do people swear by when they make an oath? They swear by Heaven, which is to say, they make an oath to God and swear by God. People might not have much of an understanding of the phenomenon by which God swore by Himself, but you’ll be able to understand when I provide you with the correct explanation. Being faced with a man who could only hear His words but not understand His heart once more made God feel lonely and at a loss. In desperation—and, it can be said, subconsciously—God did something very natural: God put His hand on His heart and addressed Himself when bestowing this promise upon Abraham, and from this man heard God say “By myself have I sworn.” Through God’s actions, you may think of yourself. When you put your hand on your heart and speak to yourself, do you have a clear idea of what you’re saying? Is your attitude sincere? Do you speak candidly, with your heart? Thus, we see here that when God spoke to Abraham, He was earnest and sincere. At the same time as speaking to and blessing Abraham, God was also speaking to Himself. He was telling Himself: I will bless Abraham, and make his progeny as numerous as the stars of heaven, and as plentiful as the sand on the sea shore, because he obeyed My words and he is the one I choose. When God said “By myself have I sworn,” God resolved that in Abraham He would produce the chosen people of Israel, after which He would lead these people forward apace with His work. That is, God would make Abraham’s descendants bear the work of God’s management, and the work of God and that expressed by God would begin with Abraham, and would continue in Abraham’s descendants, thus realizing God’s wish to save man. What say you, is this not a blessed thing? For man, there is no greater blessing than this; this, it can be said, is the most blessed thing. The blessing gained by Abraham was not the multiplication of his offspring, but God’s achievement of His management, His commission, and His work in the descendants of Abraham. This means that the blessings gained by Abraham were not temporary, but continued on as God’s management plan progressed. When God spoke, when God swore by Himself, He had already made a resolution. Was the process of this resolution true? Was it real? God resolved that, from then onward, His efforts, the price He paid, what He has and is, His everything, and even His life would be given to Abraham and the descendants of Abraham. So too did God resolve that, starting from this group of people, He would make manifest His deeds, and allow man to see His wisdom, authority, and power. 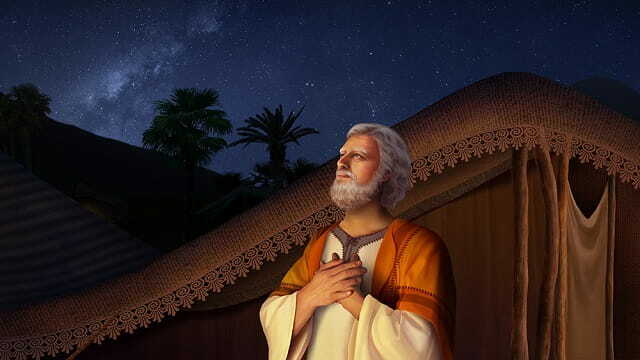 At the same time as speaking to Himself, God also spoke to Abraham, but apart from hearing the blessings that God gave to him, was Abraham able to understand God’s true wishes in all of His words at that moment? He was not! And so, at that moment, when God swore by Himself, His heart was still lonely and sorrowful. There was still not one person able to understand or comprehend what He intended and planned. At that moment, no one—including Abraham—was able to speak to Him in confidence, much less was anyone able to cooperate with Him in doing the work that He must do. On the surface, God had gained Abraham, and had gained someone who could obey His words. But in fact, this person’s knowledge of God was barely more than nothing. Even though God had blessed Abraham, God’s heart was still not satisfied. What does it mean that God was not satisfied? It means that His management had only just begun, it means that the people He wanted to gain, the people He longed to see, the people He loved, were still distant from Him; He needed time, He needed to wait, He needed to be patient. For at that time, apart from God Himself, there was no one who knew what He needed, or what He wished to gain, or what He longed for. And so, at the same time as feeling very excited, God also felt heavy of heart. Yet He did not halt His steps, and continued to plan the next step of what He must do. What do you see in God’s promise to Abraham? God bestowed great blessings upon Abraham simply because he listened to God’s words. Although, on the surface, this seems normal, and a matter of course, in it we see God’s heart: God especially treasures man’s obedience to Him, and cherishes man’s understanding of Him and sincerity toward Him. How much does God cherish this sincerity? You may not understand how much He cherishes it, and there may well be none who realize it. God gave Abraham a son, and when that son had grown up, God asked Abraham to offer his son to God. Abraham followed God’s command to the letter, he obeyed God’s word, and his sincerity moved God and was treasured by God. How much did God treasure it? And why did He treasure it? At a time when no one comprehended God’s words or understood His heart, Abraham did something that shook the heaven and trembled the earth, and it made God feel an unprecedented sense of satisfaction, and brought God the joy of gaining someone who was able to obey His words. This satisfaction and joy came from a creature made by God’s own hand, and was the first “sacrifice” that man had offered to God and that was most treasured by God, since man was created. God had had a hard time waiting for this sacrifice, and He treated it as the first most important gift from man, whom He had created. It showed God the first fruit of His efforts and the price He had paid, and allowed Him to see the hope in mankind. Afterward, God had an even greater yearning for a group of such people to keep Him company, to treat Him with sincerity, to care for Him with sincerity. God even hoped that Abraham would live on, for He wished to have such a heart accompany Him and be with Him as He continued in His management. No matter what God wanted, it was just a wish, just an idea—for Abraham was merely a man who was able to obey Him, and did not have the slightest understanding or knowledge of God. He was someone who fell far short of the standards of God’s requirements for man: knowing God, being able to testify to God, and being of one mind with God. And so, he could not walk with God. In Abraham’s offering of Isaac, God saw the sincerity and obedience of Abraham, and saw that he had withstood God’s test of him. Even though God accepted his sincerity and obedience, he was still unworthy of becoming God’s confidant, of becoming someone who knew God, and understood God, and was informed of God’s disposition; he was far from being of one mind with God and carrying out God’s will. And so, in His heart, God was still lonely and anxious. The more lonely and anxious God became, the more He needed to continue with His management as soon as possible, and be able to select and gain a group of people to accomplish His management plan and achieve His will as soon as possible. This was God’s eager desire, and it has remained unchanged from the very beginning until today. Ever since He created man in the beginning, God has yearned for a group of overcomers, a group that will walk with Him and are able to understand, comprehend and know His disposition. This wish of God has never changed. Regardless of how long He still has to wait, regardless of how hard the road ahead, no matter how far off the objectives He yearns for, God has never altered or given up on His expectations for man. Now that I’ve said this, do you realize something of God’s wish? Perhaps what you’ve realized isn’t very profound—but it will come gradually! Most people also read: Exactly what work will Jesus do when He returns? God’s wrath is a safeguard preventing all evil forces from multiplying and running rampant, and it is also a safeguard that protects the existence and spread of all just and positive things and eternally guards them from suppression and subversion. When the king of Nineveh heard this news, he arose from his throne, took off his robe, dressed himself in sackcloth and sat in ashes. He then proclaimed that no one in the city would be allowed to taste anything, and that no livestock, lambs and oxen would graze or drink water. Man and livestock alike were to don sackcloth; the people would earnestly entreat God. The king also proclaimed that every one of them would turn away from their evil ways and forsake the violence in their hands. Judging from this series of acts, the king of Nineveh demonstrated his heartfelt repentance. The series of actions he took—arising from his throne, casting off his king’s robe, wearing sackcloth and sitting in ashes—tells people that the king of Nineveh laid aside his royal status and wore sackcloth alongside the common people. This is to say that the king of Nineveh did not occupy his royal post to continue his evil way or the violence in his hands after hearing the announcement from Jehovah God; rather, he laid aside the authority he held and repented before Jehovah God. At this moment the king of Nineveh was not repenting as a king; he had come before God to confess and repent his sins as an ordinary subject of God. Moreover, he also told the entire city to confess and repent their sins before Jehovah God in the same manner as him; additionally, he had a specific plan for how to do so, as seen in Scripture: “Let neither man nor beast, herd nor flock, taste any thing: let them not feed, nor drink water: … and cry mightily to God: yes, let them turn every one from his evil way, and from the violence that is in their hands.” As the city’s ruler, the king of Nineveh possessed supreme status and power and could do anything he wished to. When faced with Jehovah God’s announcement, he could have ignored the matter or simply repented and confessed his sins alone; as for whether or not the people in the city chose to repent, he could have completely ignored the matter. However, the king of Nineveh did not do this at all. Not only did he arise from his throne, wear sackcloth and ashes and confess and repent his sins before Jehovah God, he also ordered all people and livestock within the city to do the same. He even ordered the people to “cry mightily to God.” Through this series of actions, the king of Nineveh truly accomplished that which a ruler should; his series of actions is one that was difficult for any king in human history to achieve, and also one that none achieved. These actions can be called unprecedented undertakings in human history; they are worthy of being both commemorated and imitated by mankind. Since the dawn of man, every king had led his subjects to resist and oppose God. No one had ever led his subjects to entreat God to seek redemption for their wickedness, receive Jehovah God’s pardon and avoid imminent punishment. The king of Nineveh, however, was able to lead his subjects to turn to God, leave their respective evil ways and abandon the violence in their hands. Furthermore, he was also able to put aside his throne, and in return, Jehovah God turned and repented and retracted His wrath, allowing the people of the city to survive and keeping them from destruction. The king’s actions can only be called a rare miracle in human history; they can even be called a model of a corrupt humanity confessing and repenting their sins before God. from God Himself, the Unique Peace be with you all! Dear brothers and sisters, if you have any understanding or enlightenment from God, you’re welcome to share with us.1. Via the online chat window at the bottom right corner of the screen.2. Send an email to info@testifygod.org.We sincerely hope we’ll grow spiritually through sharing with each other. Regardless of how angry God had been with the Ninevites, as soon as they declared a fast and wore sackcloth and ashes, His heart gradually softened, and He began to change His heart. When He proclaimed to them that He would destroy their city—the moment prior to their confession and repentance for their sins—God was still angry with them. Once they had gone through a series of acts of repentance, God’s anger for the people of Nineveh gradually transformed into mercy and tolerance for them. There is nothing contradictory about the coinciding revelation of these two aspects of God’s disposition in the same event. How should one understand and know this lack of contradiction? God successively expressed and revealed these two polar-opposite substances as the people of Nineveh repented, allowing people to see the realness and the unoffendableness of God’s substance. God used His attitude to tell people the following: It is not that God does not tolerate people, or He does not want to show mercy to them; it is that they rarely truly repent toward God, and it is rare that people truly turn away from their evil ways and abandon the violence in their hands. In other words, when God is angry with man, He hopes that man will be able to truly repent, and He hopes to see man’s true repentance, in which case He will then liberally continue to bestow His mercy and tolerance upon man. This is to say that man’s evil conduct incurs God’s wrath, whereas God’s mercy and tolerance are bestowed upon those who listen to God and truly repent before Him, upon those who can turn away from their evil ways and abandon the violence in their hands. God’s attitude was very clearly revealed in His treatment of the Ninevites: God’s mercy and tolerance are not at all difficult to obtain; He requires one’s true repentance. As long as people turn away from their evil ways and abandon the violence in their hands, God will change His heart and change His attitude toward them. from God Himself, the Unique II Peace be with you all! Dear brothers and sisters, if you have any understanding or enlightenment from God, you’re welcome to share with us.1. Via the online chat window at the bottom right corner of the screen.2. Send an email to info@testifygod.org.We sincerely hope we’ll grow spiritually through sharing with each other. Was there any contradiction between God’s change of heart and His wrath? Of course not! This is because God’s tolerance at that particular time had its reason. What reason might this be? It is the one given in the Bible: “Every person turned away from his evil way” and “abandoned the violence in their hands.” This “evil way” does not refer to a handful of evil acts, but to the evil source behind people’s behavior. “Turning away from his evil way” means that those in question will never commit these actions again. In other words, they will never behave in this evil way again; the method, source, purpose, intent and principle of their actions have all changed; they will never again use those methods and principles to bring enjoyment and happiness to their hearts. The “abandon” in “abandon the violence in their hands” means to lay down or to cast aside, to fully break with the past and to never turn back. When the people of Nineveh abandoned the violence in their hands, this proved as well as represented their true repentance. God observes people’s exteriors as well as their hearts. When God observed the true repentance in the hearts of the Ninevites without question and also observed that they had left their evil ways and abandoned the violence in their hands, He changed His heart. This is to say that these people’s conduct and behavior and various ways of doing things, as well as the true confession and repentance of sins in their heart, caused God to change His heart, to change His intentions, to retract His decision and not to punish or destroy them. Thus, the people of Nineveh achieved a different end. They redeemed their own lives and at the same time won God’s mercy and tolerance, at which point God also retracted His wrath. from God Himself, the Unique II Peace be with you all! Dear brothers and sisters, if you have any understanding or enlightenment from God, you’re welcome to share with us.1. Via the online chat window at the bottom right corner of the screen.2. Send an email to info@testifygod.org.We sincerely hope we’ll grow spiritually through sharing with each other.